The Porcupine tour, the animal chosen as an emblem by Louis XII, takes in some of the town’s private townhouses (hôtels particuliers) as well as the gardens of the château. Walk up Rue du Commerce for about 20 paces then turn into the narrow Rue Rebrousse-Pénil until you come to Rue Pardessus. At nos 8 and 10, two twin 15C façades are adorned with gargoyles – grotesque figures that seem to be swallowing the ends of the horizontal beams. 50m further on, on your left, admire the beautiful Renaissance doorway of the Hôtel Viart, built during the reign of François I. Through the door, which is occasionally open, it is possible to catch a glimpse of the ceiling, with its fine ribbed vaulting. Continue up Rue Porte Chartraine which, along with the Rue du Commerce, formed the central axis of the town, known as the Grand Rue, in the Middle Ages. born (1805-1871). The property also housed Auguste Poulain’s first chocolate shop, founded in 1847. Walk along Rue Saint-Honoré to your right: at n°8, the façade of the impressive Hôtel d’Alluye, built by Florimond Robertet, treasurer to three successive kings until François I, show similarities with the castle’s Louis XII wing. Here you will find Louis XII’s porcupine emblem, the entwined rope associated with his wife Anne of Brittany, their initials A and L, as well as the coats-of-arms of France and Brittany alongside those of the builders. Just 50m from here, enjoy the view from the top of a flight of steps, the Escaliers Denis Papin. The statue erected on the intermediate level is that of the inventor of the forerunner of the steam engine (1647-1712). Next, take Rue Julien Coudray, then Rue des Cordeliers, to reach the Tour Beauvoir. Built in the 11C on a mound of earth, the Tour Beauvoir was the centre of the Beauvoir family’s fiefdom. Bought by the Count of Blois in 1256, it was then incorporated into the town’s fortifications, remains of which can be seen to your left. 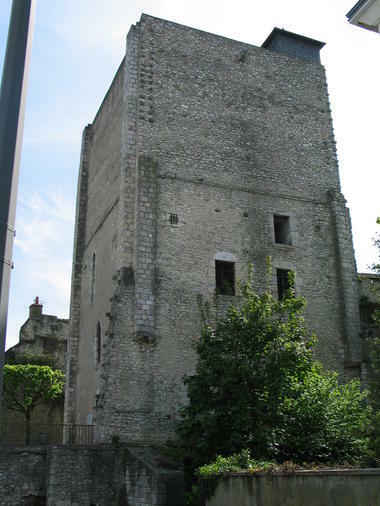 From 1430 until 1940 the tower was used as a prison. Rejoin Rue Beauvoir and then in front of you head along Rue Chemonton, which is probably an abbreviation of the expression “chemin montant” (an uphill road). At the corner with Rue du Lion Ferré, the so-called Hôtel de la Chancellerie is remarkable for its timber framework in the shape of the inverted hull of a boat. Continue along Rue Porte Chartraine, then take Rue Porte Côté to the right, a street which takes its name from the gateway which opened onto the town’s 13C fortifications at the junction with Rue Gallois. 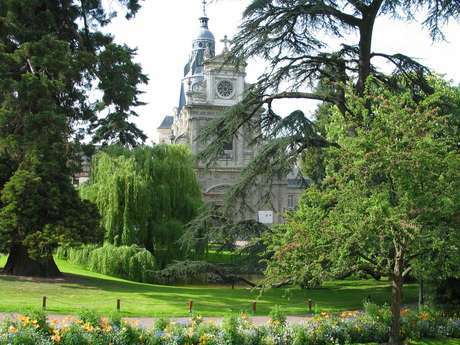 Leave the square and walk along Rue Jean Laigret to the former gardens of the château. Stand at the end of the lower terrace of the Jardin du Roi (King’s Garden) to enjoy the view of the Façade des Loges. 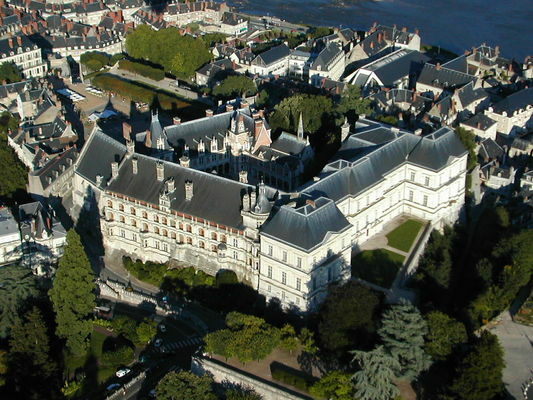 Built under the reign of François I, from 1515 onwards, it was modelled on the contemporary Loggias in the Vatican, and allowed the château to open out onto its gardens, for which Louis XII commissioned an Italian landscape gardener who was brought to Blois from Naples. These extensive gardens were subsequently cut in two by the Avenue Jean Laigret, which you have just walked along. Across the street are the remnants of the castle’s former orangery, now a restaurant, and the Anne of Brittany pavilion, behind the cedar tree. Built in an octagonal design from brick and stone, the pavilion houses a drawing room and a small oratory. The main façade of the château is fronted by a porch crowned with an equestrian statue of Louis XII and embellished with fleurs de lys, the symbol of royalty. Note the horse’s ambling gait, reserved for official parades. Crowned king of France in 1498, Duke Louis of Orléans returned to his family castle and built this new wing which housed the sovereigns’ apartments, which opened onto balconies on the first floor. Next, walk through the gardens in the square – this was the site of the Saint-Sauveur collegiate church, which was completely demolished during the French Revolution. 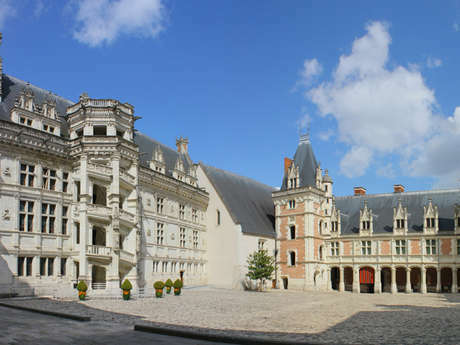 The church, the resting place of the Counts of Blois, was also the setting for important ceremonies, such as the blessing of Joan of Arc’s standard in 1429, and the funerals of Anne of Brittany and Catherine of Medici. To return to your point of departure, pass in front of the Maison de la Magie (House of Magic) and the statue of the magician Robert-Houdin. A six-headed hydra startles visitors every hour as it appears through the windows of the house (in season). Go down the Grands Degrés du Château (a flight of steps) to return to the starting point of the walk. Pour connaître les bonnes réponses, rends-toi à l'Office de Tourisme (23 place du château) et si tu as "tout juste" une surprise t'attends! idée originale et ludique de découvrir Blois en famille. Les 2h de balade ne se ressentent même pas. C'est dommage que la réponse 1 et 3 soient erronées. De plus, à la fin du circuit, l'office du tourisme ne nous donne pas plus d'explications sur ces erreurs. Et paraît étonnée quand nous parlons de la "surprise" qui attend nos enfants si le quiz est tout bon. C'est vraiment dommage pour les enfants. par contre, un petit livret de jeux a été donné en compensation !